I’ll always photograph panoramas like this, which I call “The Passaic River Flows: Indians, Farmers, then Industrialists and Neglect, Now Rebirth.” Such landscapes contain stories and relationships that words and statistics piled together, even with great skill, cannot convey. The Passaic River meanders along through New Jersey for 80 miles, and its Great Falls in Paterson once ran that early city’s silk mills and are still considered a scenic wonder, but just before the Passaic empties into Newark Bay it flows through one of the most urbanized and industrialized areas in the nation. Only 400 years ago, before Henry Hudson and the Dutch came, the Lenni Lenape Indians fished its waters. Only since the early 1970s have there been efforts to clean up the river, and the water quality is still not great, though high school and club rowing crews have been using it for decades. Certainly no commercial fishing is allowed and no one is supposed to eat anything they catch in the lower stretch of the river. For more than a hundred years factories lined the river, operating 24/7, and dumped all of their waste into the water. Just google Dioxin and Diamond Shamrock and Agent Orange for a few facts about what still lies in the river’s sediments. In my photograph, Newark is on the left, Harrison on the right. 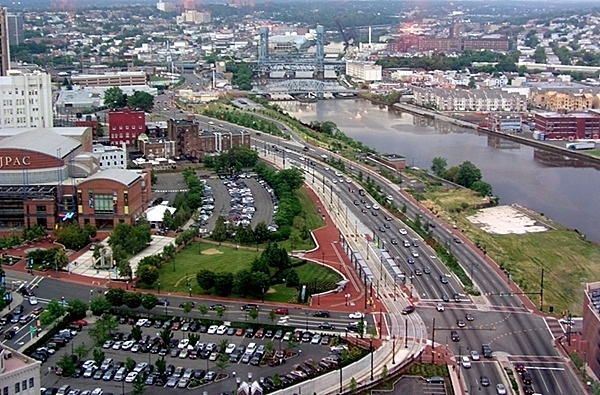 Newark has redeveloped many acres over the past decade or so; the New Jersey Performing Arts Center is visible, as is an improved McCarter Highway and a light rail system. Harrison is busy, too, with condos and commercial buildings going up and a world-class soccer stadium under construction for the Red Bulls where acres of old red brick factory buildings once stood. I don’t know of any other American landscape that’s gone from pristine ecosystem to total heedless exploitation and degradation, then been an abandoned wasteland for decades before ultimately seeing as much rebirth.